« Oahu Here I Come! This is part one of a 5-part post from my recent visit to Oahu. I’ll try to disperse the following places along with Big Island places over the next few weeks: Angelo Pietro, Kaka`ako Kitchen, Elena’s, Yotteko-ya (thanks for the recommendation reid! ), and Popeye’s. Visiting Oahu makes me feel like a child in a candy store, except now, I feel like a guy with so many great food choices, I don’t know what to do! I’m originally from Oahu, and every time I go back, so many fond memories come back to me. 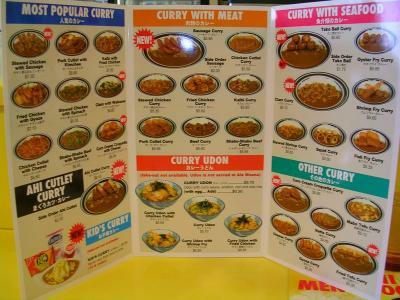 Curry House is a successful franchise originating from Japan and I just *have to* eat here every time I go to Oahu. I hear they have hundreds of them in Japan! Oahu is lucky to have 5 locations: Waikiki, University Ave, Ala Moana, Pearl Kai Shopping Center, and McCully Shopping Center. Most of the time, they are consistent in quality and taste. We went to the Pearl Kai Shopping Center one this time. The people are really nice here and the food is always good at this location. It was really crowded! We had to wait a few minutes before getting a seat. While waiting, there were a lot of take-out orders being picked up. We then ended up sitting at the bar, which is a good thing since we get a free entertainment show. Watching them pour the curry over fresh hot rice and meats is so exciting! 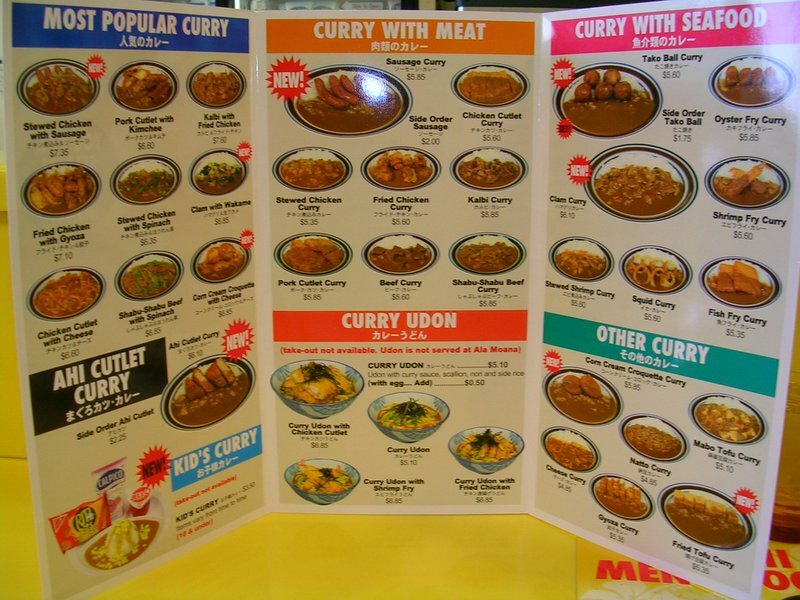 There are so many different kinds of items to choose to go with your curry! They use the same curry sauce (spicy or mild) for all the dishes, but the variations are endless when you mix it with the different items on the menu. You can choose how much rice you want and if you want spicy or mild curry. I ordered the beef curry (my fav), a side of cream corn croquette (a new item), and we also shared a side salad. Click on the menu above to see a sample of the different kinds of curries! The beef curry was so good. 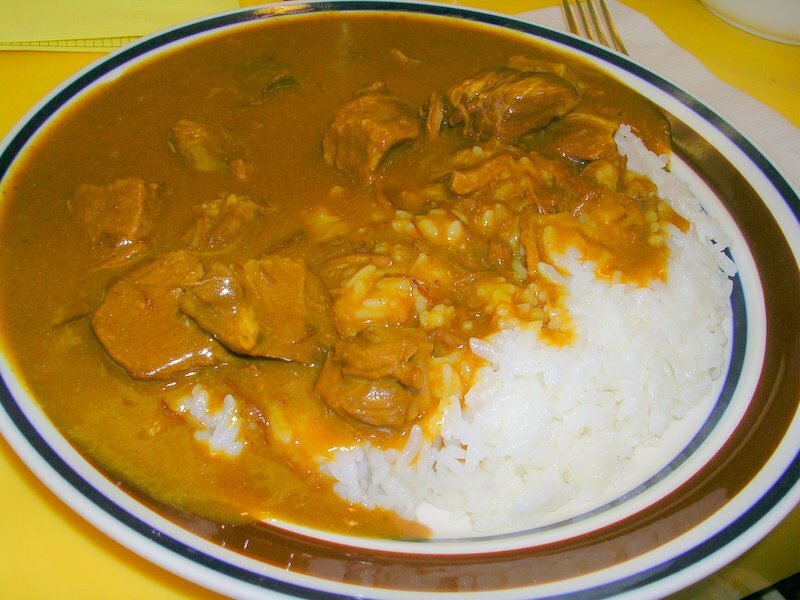 Curry House’s curry is a Japanese style curry. It’s very smooth, rich, thick, spicy, and a little sweet. The beef pieces are so tender, too. Also, I love the beef curry because they stew the beef with the curry, and the beef flavor permeates all of the curry, making it so rich and flavorful. 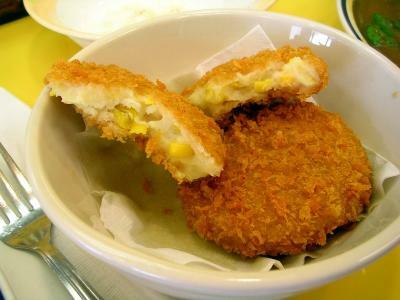 The cream corn croquette tasted like cream corn made into a hash, then breaded and deep fried. It was a bit sweet and went very well with the spicy beef curry. Very yummy! The salad was really good too. 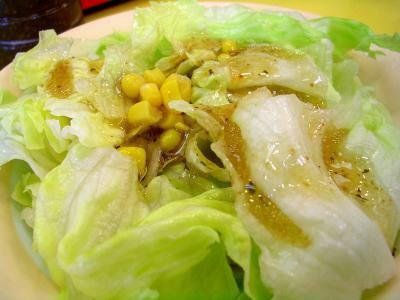 What makes this salad is their great tasting shoyu-based dressing and the corn. Bev ordered Chicken Cutlet with Spinach Curry! This was quite tasty as well. The chicken was nice and crispy and the spinach tasting really fresh and not overcooked. I’m so proud of Bev since she graduated to spicy curry, which tastes so much better than the mild! All set to eat? Don’t forget the pickled vegetables called Fukujinzuke, I think. It’s great sprinkled over the curry. I’d love to know what other people like to order at Curry House. And If you haven’t eaten here yet, you must! 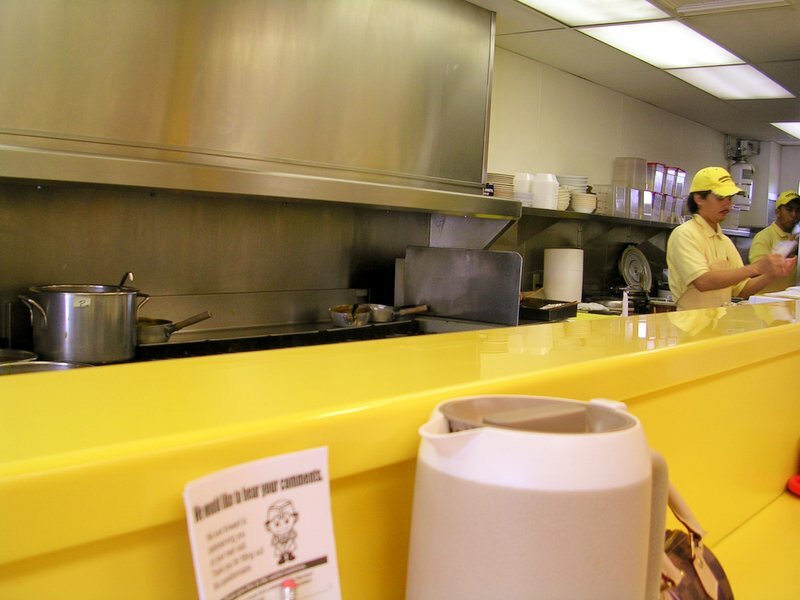 This entry was posted by James on Tuesday, August 2nd, 2005 at 11:25 am	and is filed under Japanese, Oahu, Restaurant Reviews. You can follow any responses to this entry through the RSS 2.0 feed. You can leave a response, or trackback from your own site. 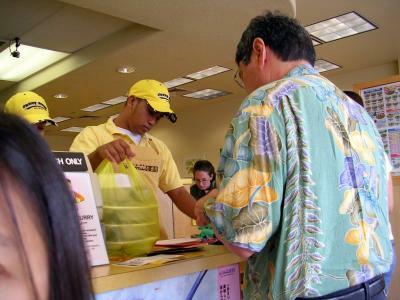 I have to tell you that I don’t visit the McCully location anymore even though I live close by. You’re right about the location at Pearl Kai. The staff there is so pleasant that it makes the drive worth it. In fact, I’m here at least once a week! Lately, instead of the curry rice, I’ve been eating the udon. It’s so yummy! Hey Reid! Thanks for visiting again. Yeah, the people at Pearl Kai are really friendly. They always say Irashaimase!!!! no matter how busy they are. I always find that amusing. MMmm.. the curry udon is so good too! I only eat it sometimes even though it’s good. I guess I need rice with curry. Ahh..Reggie… 15 minutes and pau? Wow! Congratulations! I was so sad when they discontinued the curry challenge. I always wanted to try. I dunno if I could’ve made it, though. Yeah.. the s&b one is not bad too.. but still not the same. I really wonder how curry house makes theirs. One of those burning questions throughout the rest of my life, probably. Thanks for visiting. a few episodes of Soko Ga Shiritai had some revealing curry restaurant secrets i recall. and they did theirs all from scratch and slow cooking. plenty love and patience in the process guaranz! 15 mins and was hot steamy and spicy! i requested lots of cheese to cool the spicyness down a bit. it really worked! James, I have a HUGE favor to ask. Since you have a few of the CoCo’s in your area, I was wondering if you could find out the nutritional value on their most popular menu items. I live here in Japan and there is a language barrier that cannot be overcome unless one is just “ordering from a menu”. I ask for the nutritional value because since being here in Okinawa, I’ve eaten a few too many times at our CoCo’s…it’s addictive! Anyway, my friends and I are watching our diets via Weight Watcher’s online (since they dont’ have WW here). We need information as to Fat, Calories and Fiber per serving. If you can help us out, or point us in the right direction…I would GREATLY appreciate it! Lisa, there are no Curry House’s on the Island that I’m on. I only get to go when I visit Oahu. I will see if there is nutritional info available on my next visit, but what might help right now might be their website. It’s Japanese, but I put the webpage into babelfish and it’s somewhat useful Click here to see! This is one of my favorite places to eat when I visit Oahu. Absolutely, wonderful curry. I happened to find your site because I was looking for new places to try on the Big Island when I visit in October. I can’t wait to try some of your recommendations. Love curry and never thought that I would ever find a food establishment where I can eat Katsu Curry, and I must say that it is the best! Holy crap! I never knew that there was a Coco Ichibanya in the states! My hubby and I have been living in Japan for over a year and there is a CocoIchi right across the street from us. It is both a blessing and a curse–in fact right now I have a major hankering for some sausage curry and I know they are open until midnight….now I just have to find some yen. I have to admit that I am a wuss–I started at a level 2 and now always get the mild. The hubster tried the challenge here a few years ago before it was discontinued, and sadly he did not beat it. But he sure got some really deep bows from the Japanese for trying! Loved CoCo’s Ichibanya while stationed in Okinawa, although many of my local co-workers said that it’s “fast-food” and not comparable to home cooking…but I digress. The closest you can get to making CoCo’s at home is by using S&B curry (comes in blocks that look like chocolate). I melt one whole block in 2.5 to 3 cups of water, add cooked (to a crisp) bacon, a touch of brown sugar, and simmer for 10 minutes. Add more water as desired, because the curry tends to thicken. If you’re adventurous enough, add a dash of Sriracha Thai chili sauce for that added kick. My kids awear by it! E-mail me at simpork@gmail.com for a detailed recipe! I am wondering if there is anyway to order the curry from the locations in Hawaii? 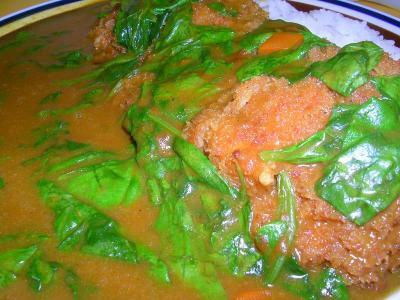 I make my own version of coco’s curry but its just not the same as the stuff we got on the Rock. I am a big fan of cocos and I haven’t had the taste in over two years now. I would like to know who to get in contact with to start a chain in the states. I currently live in Florida and i know alot of people who would love to have some. Please contact me or get me the information. I wuold really appriciate it. Hi, I’m a big fan of Ichibanya Coco Curry. Does anyone know the contact information for Coco Curry to start a chain in Indonesia? I checked out their website but everything is in Japanese. Pls help! Thank you much. You think the only people who are people, Are the ones who look and think the way you do, But if you walk the footsteps of a stranger, You’ll learn the things you never knew you never knew… You can own the Earth and still, All you’ll own is earth until You can paint with all the colors of the wind. How I add this article to Netscape Bookmark? I am just like the rest of you searching for a curry recipe that will tame my craving. Does anyone have an idea on how to make this stuff? I was stationed in Okinawa Japan for 6 yrs. And I tell you I miss CoCo’s so much. I wish there was a way to order their gift boxes that I use to see for sale. But their website is written in Japanese. Buy automotive audio at low prices…. I was at Okinawa too…and how different the food is in Oahu then in Japan. Yea the chicken cutlet is the best!!!!!!!!!!!!! Maybe one day they will open one here in Sacramento HAA that’ll be the day someone would make alot of money! I was stationed on Oki for 9 years (Kadena). I think I must have spent a fourth of my paycheck every month at CoCos!! LOL That was the best! Yep Chicken cutlet, 300grams of rice, level 2!! WOOHOO!! I really miss it. I have friends that send me the gift packs on occasion. But since I run out of it too quickly, I looked for a substitue. I can honestly say that the S&B Golden Curry (medium-hot) is the closest to CoCos as you are going to find. 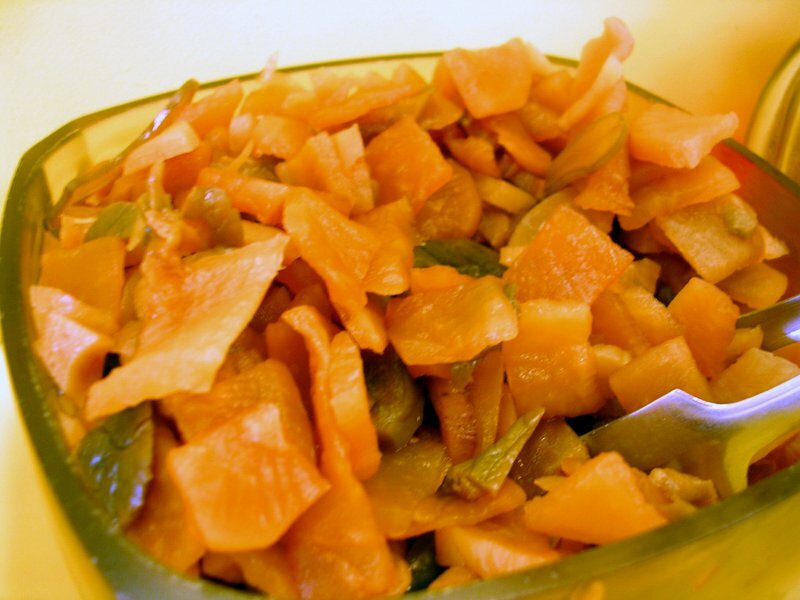 It tastes similar and takes care of the CoCos craving! You can find it in most grocery stores in the oriental food section. Hope this helps everyone! Enjoy! Fried Chicken curry, Spicy 8, 9, and 10. I NEED IT and I am no longer in Oki. bummer. I saw there are couple people asking about how to start a chain of Coco Curry. I’m also interested in making one but Mitzy was right, the website is all in Japanese. If anyone know the answer, please contact and inform me. Thanks!!! 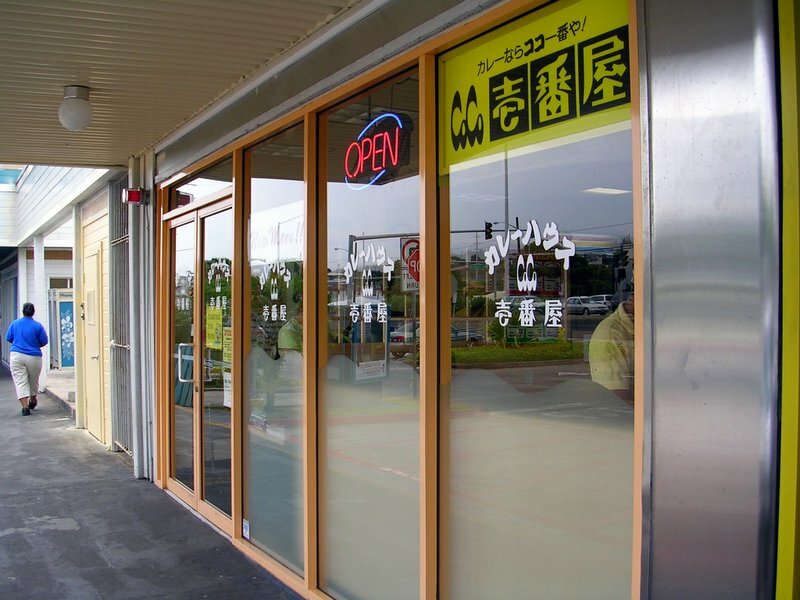 Could I get franchise informaton of Curry House in details. Please just give me an idea for the location, initial investment to be required, a sort of procedure, an so forth. Jennifer, there is Coco Curry sauce for sale on eBay. Hope this helps. I talked to a few friends, and I know for a fact they sell the curry sauce in the restaurant. I guess your best bet is to either have a friend send it you or convice them to sell it on ebay. I’ve looked it up on ebay and had no luck. I too love it so much. I remember when I moved back to the states how much I craved it. Now, I can’t take it. So, I’m trying to find it online to buy it. If any of you have any luck PLEASE let me know. I just went to Japan in July and ate at A CoCo’s there. I now am on a hunt on how to buy CoCo’s curry. They had it in packages and I almost bought them then, but I thought just order online when I get back to the states! But I am having no luck. Hopefully you can help me! I could live on this stuff. I am SO pleased to see one in the states. Does anyone know how I could get some shipped to the lower 48? Well i have ate at the coco’s in japan and they do have a lot of them there. 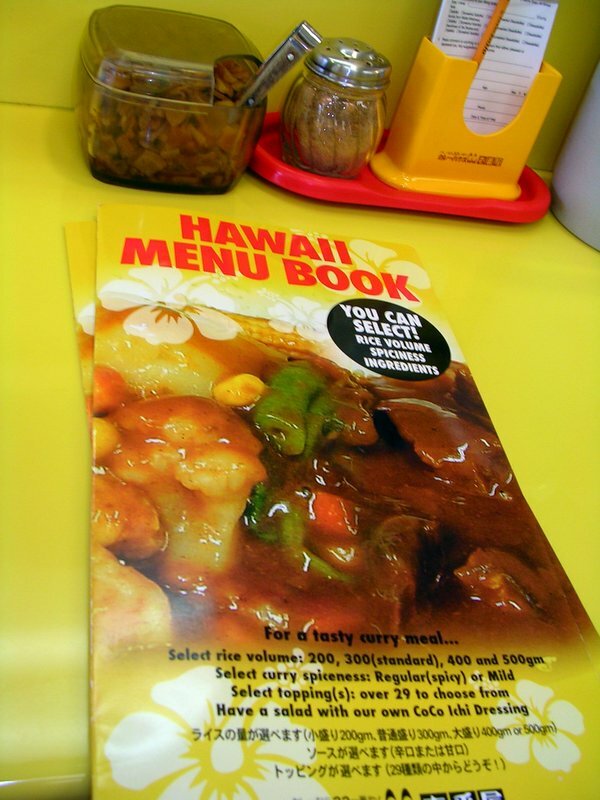 i know that in japan they sold the curry prepackaged at the resturant but i dont know if they do that in the one in hawaii. but i always ate eggplant curry with corn added level 6, man i loved it so much. oh my god. COCOS!!!!!!!!!!! I just got home from Okinawa after visiting my boyfriend who is a Marine there. Coco’s was the best meal of the trip. I was there for 2 weeks and we ate there about every other day. I always got level 4 light crispy chicken, spinach, and cheese. spectacular. I am going back in June and it WILL be my first meal after I get off the plane. Haha, it seems Cocos is an AF tradition. I guess I can see if I can pick up a whole box next time I’m outside the gate. I leave mainland Japan in 6 months and soooo gonna miss CoCos curry. Me and my buddy eat there at least 3 times a week! Beef curry 300g, level 5, chicken cutlet and cheese! OHHHH SOO GOOD! I have been buying packs and sending them home to store for a later date. The will be missed! I left Japan in 2006 and was so mad when i didnt think i would ever see another curry house. I just so happen to go to hawaii and a friend of mine informed me there were a couple in Hawaii and I had to go to the one in Pearl Kai and it was amazing again. Went two days in a row. Just wish they would open one up in the continental US close to my house. I usually get the chicken cutlet curry and the second day I got the shrimp and the shrimp stew. They are all amazing. I am in the with the United States Navy. iam a muslim man and i want to eat in curry house but when i asked one of your bransh if the beef curry 100% beef or mixe with pork they said its beef mixe with pork souce. this was last year, so still this curry same as before or been change. also i want to now from which country coco using the beef. It is appropriate time to make some plans for the long run and it’s time to be happy. I have learn this publish and if I could I wish to recommend you some attention-grabbing things or suggestions. Maybe you could write subsequent articles referring to this article. I wish to learn more issues about it! He always kept preaching about this. I’ll forward this article to him. Fairly certain he’ll have a good read. How i can get coco ichibanya franchise in stuttgat germany?? Anybody know how can I get Island Grinds here in Peru ? Great information, please add some posts about music. Thank you so much for the post admin. This article is ery helpful. definetly suggesting to all my friends. This is awesome, One of the best blog out there.